Cut French Bread into 1 inch thick slices. Randomly fill a large pan or baking dish with the bread at least 3 inches deep. Melt butter and mix all remaining ingredients in a separate bowl. Pour this mixture on top of the bread and let soak for about 5 minutes. Pressing bread down occasionally. Bake in a 350 degree oven for 45 minutes or until the pudding rises. Top with Caramel Sauce and roasted almonds. In a sauce pan heat banana liqueur until you get a flame. Now add the heavy cream and brown sugar. Let simmer until sauce becomes creamy. Add butter and cinnamon. 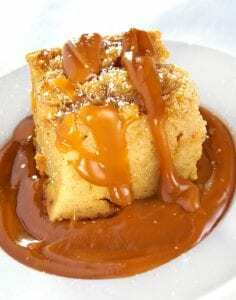 Serve over warm bread pudding. Top with roasted almonds. Place almonds on a pie pan in a 350 degree oven, Cook until brown. Preheat oven to 250 degrees. In a bowl, beat the egg yolks and white sugar with a mixer at medium speed. Set aside. In a pan, bring the cream to a boil over medium heat. 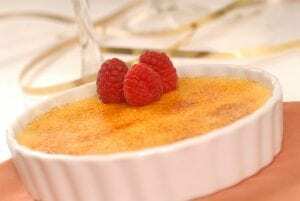 Remove the cream from the heat immediately and add it to the egg-sugar mixture while continuing to beat. Add the vanilla and continue to beat until the mixture is completely cool. Bake for one hour and thirty minutes. Remove the cups from the pan, allow to cool at room temperature, then refrigerate until chilled. When chilled, evenly spread 1/2 tablespoon of dark brown sugar over the mixture in each cup. Place the cups on a sheet pan and set under the broiler until the sugar melts, darkens and forms a crust, 20 to 30 seconds. This is the brulee process. Refrigerate until ready to serve.